My favourite clips for use with the Master bags for decorating cookies with! Perfect for keeping your piping bags closed! This handy bag clip is designed to tightly close and keep bagged (paper or plastic) contents fresh for months. They are very easy to use, just close the clip around the open end of the bag – similar function as a hair barrette. Thanks to its patented memory hinge, twixit!™ clips have been shown to open and close more than 1,000,000 times in independent tests - while in extreme temperatures. 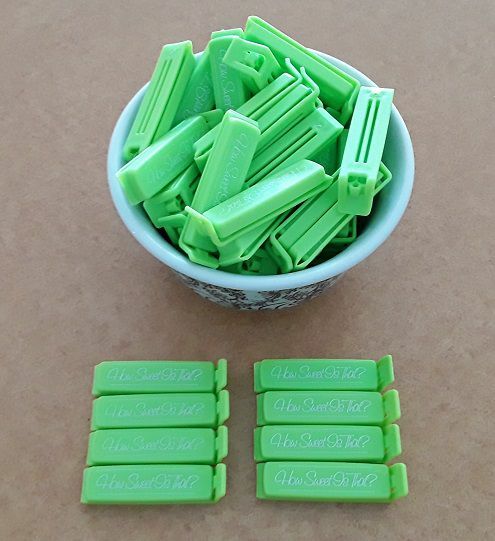 These clips have a memory, if they lose their shape just place in boiling water for a minute and they will return to their original shape. Reusable for years and years. Made of PP. Out of stock. Available online only.